Mystery of the Ancients: Three Guardians takes you to Green Hill, following a frantic phone call from your niece, Elena. Her boyfriend Stephen mysteriously disappeared and demonic black crows have invaded the small town. 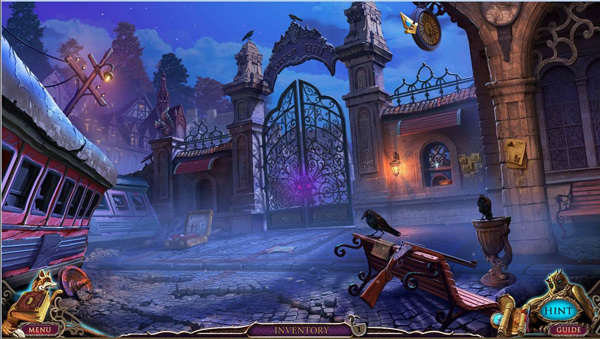 Uncover the secrets of the man in the feathered cloak and rescue Stephen before it’s too late in this stunning hidden object adventure game! Usually when I sit down to try out a game, I might play for 20-30 minutes to get an idea of the plot line, the type of play, and the general sights and sounds. When I set out to play Mystery of the Ancients: Three Guardians Collector’s Edition, I was shocked when an hour had passed. I was so involved in the game, I might have let my daughter stay up a little later than normal (there goes my Mom of the Year award). I wascompletely captivated by the stunning graphics, intriguing plot line, and top-of-the-line gameplay. Mystery of the Ancients: Three Guardians begins with a cut scene, showing lovebirds Elena and Stephen camping in the woods. When Stephen goes to investigate a strange sound that spooked Elena, the skies light up a brilliant purple hue and Stephen doesn’t return. Elena sees a giant, devilish bear-like creature with glowing red eyes. The disappearances continue as the police officers investigating Stephen’s disappearance don’t return and residents are being swept away by clouds of black smoke. A strange man in a feathered cloak is terrorizing the town, which has been all but abandoned in the wake of the occult invasion. 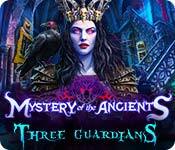 Mystery of the Ancients: Three Guardians has all of the features of a well done CE series game – achievements, collectibles, bonus chapter, extra content, integrated strategy guide, and interactive map. The graphics and animated cut scenes are among the best I’ve seen, and I almost enjoyed the supporting music. The voiceovers left something to be desired though. While the voice acting itself wasn’t too bad, it was the strangest mix of fake accents I have ever heard. I got the impression Green Hill was something of a Nordic village, based on the fairy tale that provides the background story featuring a girl named Greta. However, the voiceovers included Latin and British accents and one decidedly back-country Southern sheriff. So don’t ask me where Green Hill is because I have no idea. 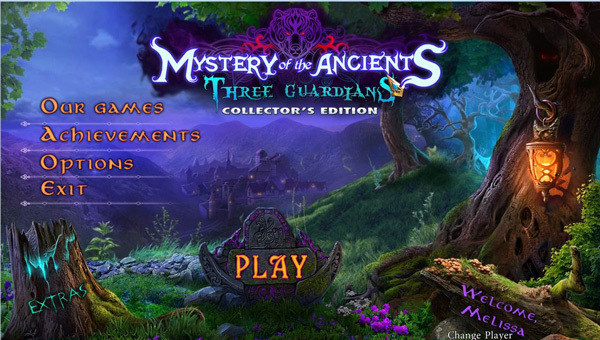 What most impressed me in playing Mystery of the Ancients: Three Guardians was the logical progression of gameplay. I was rarely stumped looking for a next move, and could easily refer to the jump map to see which areas had action items. Beyond that, the integrated strategy guide could also provide some guidance or the hint button, which refills almost instantly in casual mode. I was able to easily work through the game with a quick glance at active areas and inventory items. Unlike some games that will have you going back several scenes to use an item, most found objects are used in an adjacent scene so it’s easy to remember where it may belong. I really enjoyed making my way through each scene because it was very well laid out in my opinion. 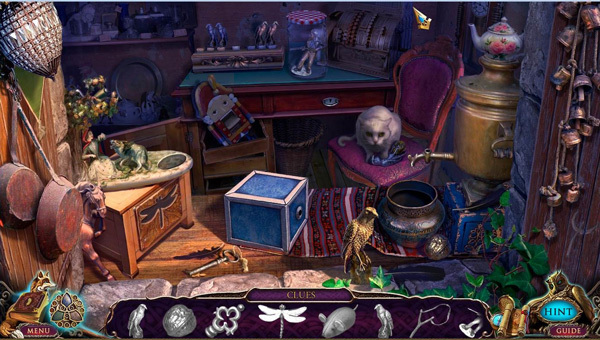 The hidden object scenes in Mystery of the Ancients: Three Guardians are unique and interesting. In addition to the traditional HOS finding items based on a list or silhouette, there are also progressive moves and games within the HOS. The first scene has you find objects and then use them to interact with the scene to uncover the next object. It took me a minute to figure out what I needed to do but the scene was simple after that. Some objects unlock mini-games to be completed before it will release the next item. 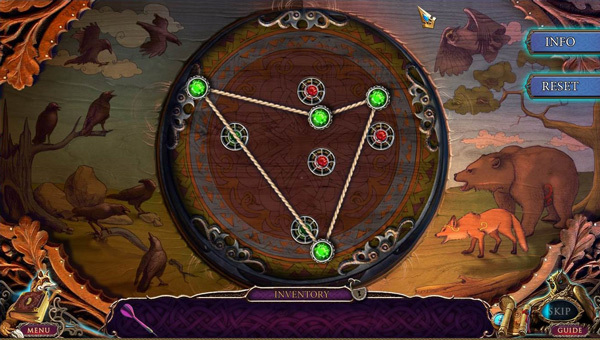 Mystery of the Ancients: Three Guardians also contains plenty of mini-games, many of which you encounter within HOS. They are relatively simple games – matching, ordering, following a formula, etc. – but tie in well with the theme of the game. One of the early scenes opens an old-fashioned storyboard that tells the story of Greta and the three guardians. It does require some interaction, but it’s very intuitive and a great way to introduce the theme of the game. If you couldn’t tell up until this point, I truly enjoyed Mystery of the Ancients: Three Guardians. The game is very well put together with superior graphics and top notch mini-games and HOS. This is definitely a CE worth buying!